The Strata-Sphere » Kerry Admits North Korea Cheating On Nuke Agreement In 1997! John Kerry’s biggest problem for himself and Democrats is his mouth. This morning on Fox News Chris Wallace challenged Kerry about his claim that Bush let NK get the bomb. Wallace said experts say NK began cheating in 1997. Kerry let slip that ‘of course’ NK was cheating on the agreement, and that we knew (in 1997 that would be President Clinton as the ‘we’). Kerry then made the ridiculous claim that if we just let NK keep cheating on their commitments to NOT build a nuclear bomb, then they would not have built a nuclear bomb. The man is borderline delusional. If we let NK continue to violate their promises and work to build a bomb then they won’t??? Scary how close this man came to being President. saw the interview in question. I kept hoping that chris wallace would ask the final one last question that he didn’t. mr. kerry, if after following your continued diplomatic efforts the north koreans still developed a bomb in secret and later tested it what would you do then? mr. kerry, after the UN sanctions, which you championed, the north koreans still continued to test their new nukes what would you do then if the rest of the world decided to do nothing as they have to date? mr. kerry we are waiting for your answer. his circle jerk would be unmasked. we would be right where we are today. there are no “first strike” pre-emptive militarty options and lil’ kim knows it. the fabled “seoul” blackmail card. At least the Bush policy has gotten us to this date a lot sooner which i believe has been their point all along–to get us to the obvious as soon as possible so we may potentially come up with a solution–if one exist. on a positive note, china and russia are revealed as the frauds we knew they were. the bad news, iran is getting the bomb next and like korea, we cannot do anything about it until one goes off. Of course, the Democrats’ rationale for delivering nuclear knowhow to Kim Jung Il was that said technology would only be employed for “peaceful energy needs”. 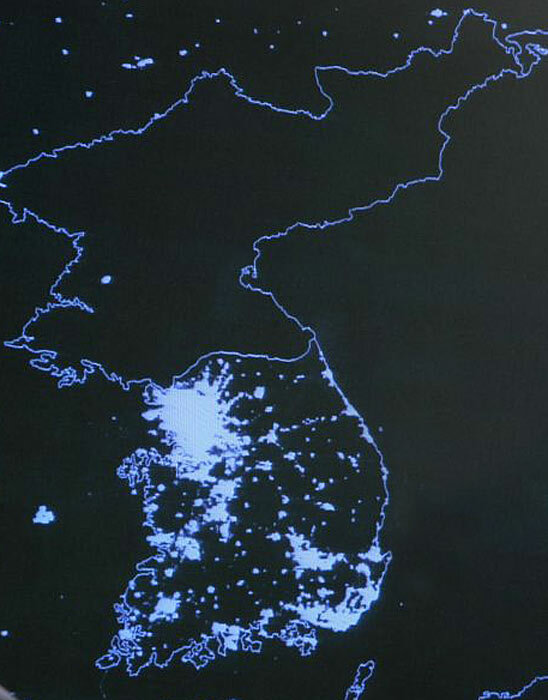 Well, here’s a recent satellite map of both North and South Korea illustrating how well that turned out. From a post I made on 12/15/05 at Free Republic. “The Geneva accord constitutes a profound change in US policy concerning the North Korean nuclear arsenal. Washington gave up on preventing the DPRK from becoming a nuclear power. Washington even no longer insists on verifying the extent of the North Korean arsenal through IAEA inspection. Instead, the US opted to appease and bribe North Korea with the hope that Pyongyang would freeze its nuclear build-up. Washington is buying time while maintaining the charade that the DPRK does not have nuclear weapons. Consequently, the US and its allies have settled into the do-nothing-for-now mode, merely postponing the hour of reckoning. To Continue with Kerry’s own words: This one I love, because in effect he is talking about himself. He didn’t realize it at the time, but in retrospet, he may regret either his former or his present statements…. John Kerry is dumb as a box of rocks. He flips.He flops. He can’t make up his mind. He changes his mind. He has no mind. People said he did well in the debates in 2004. I heard him make several stupid statements, for example, on nuclear proliferation agreement, he said he would disband this. No one said a word . No comeback at all. I sat there with my mouth open in astonishment. this will chill some souls…….